We are pleased to announce that, after a five year break, the ScienceSeeker Awards has returned! We hope that these awards will be a way to feature several of the most outstanding blog posts, podcasts, or videos from the past year, and highlight the widespread talent in the science blogosphere that ScienceSeeker seeks to promote. Humanities: Including posts from sites that correspond to our development, economics, ethics, gender, history, language, law, philosophy, policy, political science, religion and atheism, social science and sociology bundles. The environment and our place in it: Including posts from sites that correspond to our anthropology, archaeology, climate science, conservation, evolution, geography, geosciences, oceanography, palaeontology and oceanography bundles. Health, medicine and brain science: Including posts from sites that correspond to our clinical research, clinical psychology, health, medicine, neuroscience, nutrition, psychiatry, psychology, public health and veterinary medicine bundles. Academia: Including posts from sites that correspond to our academic life, student life, grants, career, education, publishing and library science bundles. Podcast: Including posts from sites that correspond to our podcast bundle. Physical sciences and technology: Including posts from sites that correspond to our artificial intelligence, astronomy, computer science, energy, engineering, mathematics and physics bundles. Big biology: Including posts from sites that correspond to our behavioural biology, biology, ecology, marine biology and plant science bundles. The nomination process will run from January 18, 2018 through midnight Pacific Standard Time on March 1, 2018, so, really, the evening of February 28 is the time for last minute nominations. Please use this form for nominations. Individuals can nominate their best post of the year in only one category. The first nomination received from any individual will be the only one considered. Multiple posts can be nominated from the same site – prizes will be awarded to the individuals that created the post. In the event that there is a joint post, that will be the only post considered by the individuals involved. So, you can submit a post you created by yourself or jointly, but not both. The ScienceSeeker team will collectively determine the winner for each of the nine categories, as well as the overall grand prize winner. The winners will be announced on April 1, 2018. What posts, or podcasts, or videos, are eligible? 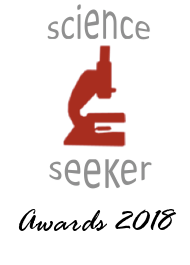 Any post, podcast episode, or video that was first published between January 1, 2017 and January 1, 2018 are eligible for the ScienceSeeker Awards. The post can be from anywhere, be it a personal blog, an institutional website, or a large media organisation. If you’re entering and are not already in our bundles, why not submit your site here? Podcasts should only be entered in the podcast category. Infographics and sci-art should enter in the general science and graphics category. Videos and text posts can enter in whichever subject category is most applicable. Feel free to leave a comment on this post, use the contact form, or tweet us @SciSeeker. For more detailed questions only, email us at sciseekers at gmail dot com.